While on the Girvan yesterday looking at a potential site suitable for a green engineering solution to cut erosion, we became aware that there was slurry spreading going on nearby and boy was it going on! It’s the time of the year for it and there’s no doubt the black stuff makes the grass grow and reassures you that your sense of smell works perfectly. Now we understand the weather at the moment is ideal for a bit of spreading and normally we’d say, ‘Fill yer boots’ but, we couldn’t help but notice that the 10m ‘no spread zone’ (from the bank top) appeared to be less than 1 m. We try to work with farms to improve things but this is unacceptable in most peoples book. As we have no statutory authority, we are left with only one course of action in circumstances like this and that’s to request SEPA’s assistance to ensure regulations are met. 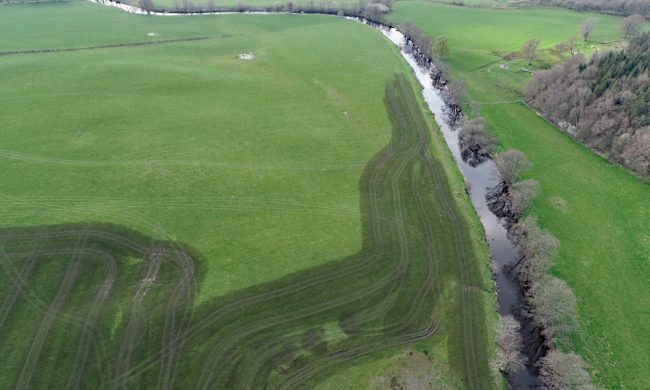 Thankfully, inappropriate slurry spreading is reducing and hopefully will soon be a thing of the past. SEPA’s ‘Mind the Gap’ campaign was widely publicised over several years and has made a difference but obviously there’s still a number of people that have yet to hear! There’s supposed to be 10m minimum gap between the bank top and spreading. I guess there’s no buffer here at all then. The bird’s eye view tells the story. Mind the Gap….what gap? We want to restore rivers and that often involves correcting and addressing historic land use or management practices that have led to problems. Slurry spreading is one of those practices that happens. It’s unavoidable and we accept it as there are regulations, guidance and codes of practice in place to protect the water environment. We keep hearing that there’s over 80% compliance across Scotland but we do see failures here in Ayrshire all too frequently. At what point can we expect things like spreading up to the bank top or in heavy rain to cease? There can’t be anyone in the Country under the misconception that this type of practice is complaint with regulations and general binding rules…can there? SEPA’s invested huge resources in raising awareness and publicising the general binding rules but still this happens. What more is required to correct these failures? Anyway, the erosion site we looked at is a cracker and in much need of help. With the volume of silt and soil entering the Girvan from the numerous sites like this and other inputs that happen, there’s little wonder that the lower river doesn’t produce as many salmon as it could or should. Silt coats the spawning beds and smothers developing eggs starving them of oxygen. Nutrients feed algae and overnight it consumes oxygen leaving fish gasping when the water temperature rises. An eroding bank that we may be able to stabilise using green engineering techniques that offer cost effective and natural solutions. 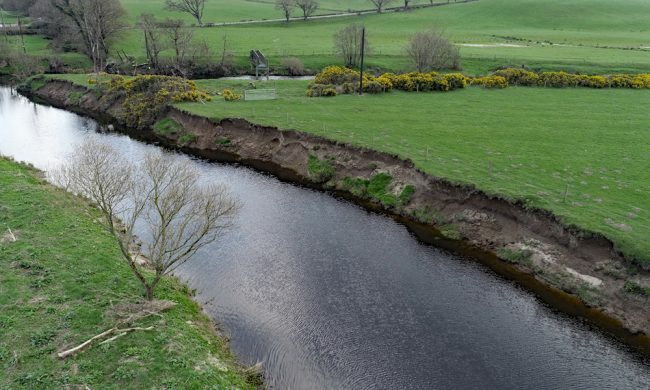 We’ve applied for funding to address severe erosion on the Girvan and if successful, we will be in a position to help one or two landowners to protect their land. 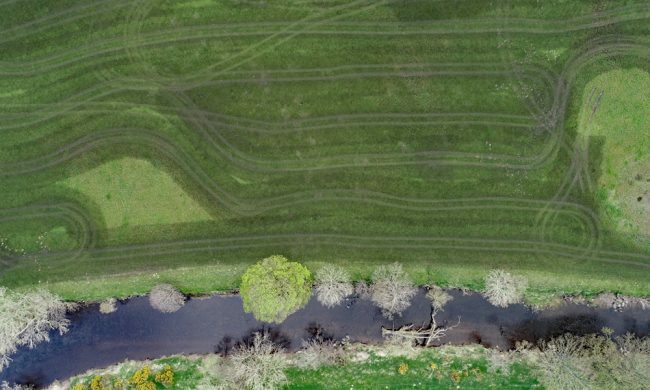 We will work with any farmers and landowners who would like assistance to help improve rivers across Ayrshire. We can help and welcome a challenge. srdp fund green engineering and we can help landowners secure this funding and deliver worthwhile solutions. Our number and contact details are on this web site. Give us a call and help us make Ayrshire rivers cleaner and healthier for everyone to enjoy.